Who can afford Bryce Harper? With another team entering the Bryce Harper auction, it is time to discuss the intricacies involved in signing a contract for a player like Harper. Any signing of Harper will require a ratification from the principal owner of any team. Be it Ron Fowler of the Padres, Jerry Reinsdorf of the White Sox, John Middleton aka “Stupid Money” or Ted Lerner of the Washington Nationals, the owners will make the ultimate call before pen is put to paper. Fiscal responsibility along with rational exuberance versus the school of stupid money does have blurred lines on a signing like these. Every owner wants to know what a player like Harper would mean to an incremental increase in wins, attendance, and revenue. They then have to weigh all of those figures against an increase or decrease in profit, and analyzing the team’s salary threshold against the CBT. When the Phillies transitioned from 2006 to a playoff team in 2007, there attendance rose 407,000 for the season. It led Jimmy Rollins to publicly call the Phillies fans “frontrunners” who only show up when the team is winning. Their stadium would be sold-out for several seasons during the Roy Halladay years and in 2010 they sold 3.77 million seats and steadily fell to 1.83 million in 2015. You can do the numbers and see the Phillies could easily fill that stadium from the current levels of half empty to mostly full if they got Bryce Harper, and yes Middleton knows it too. Even at the lower attendance of year’s past for the Phillies, they are turning huge profits of over $90 million last year. The White Sox have a similar situation where winning brought the fans. After their World Series win in 2006 they near reached 3 million fans averaging 36,506 fans per game compared to last season at 20,110. The White Sox would need a large increase in attendance to afford Harper because they have already increased their payroll this year by $19 million and their profits are about $30 million. With no increase in attendance their profit would be approximately $11 million. 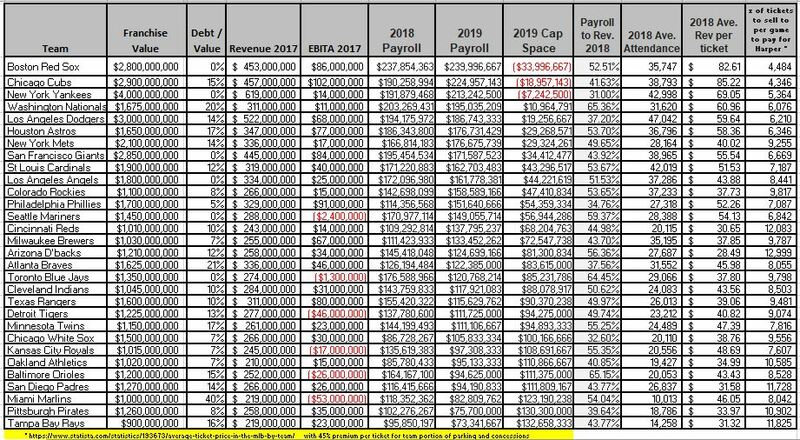 The Nationals are in a precarious situation as they would blow past the CBT cap if they sign Harper and be subject to a 50% tax penalty on every dollar they exceed the $206 million threshold. The team would most likely go from a profit to a loss if they cannot sell naming rights and receive a sizable increase in their MASN annual rights fee. The Nationals could also see a decrease in attendance after the windfall from the 2018 season where they hosted the All-Star game. The Padres have decreased their payroll going into 2019 and have plenty of room to add payroll for the 2019 season. Given their FOX TV deal, they also have the same revenue as the large market White Sox. The issue with the young Padres is their payroll will go up as their players reach arbitration. The Padres are not looking for a long-term deal. Each team looking at Harper have their own criteria for making a deal work. We have included all teams in the table at the bottom in case another mystery team jumps in.